This nativity representation emphasizes contrast and similarity. The two dominant mother figures are of pre-Columbian tradition. They represent a birthing mother (right) and a mother feeding her child (left). The nativity scene, dwarfed and traditional in style, suggests a stark but welcome contrast. Each of the figures is a little masterpiece of ornamental design in pre-Columbian tradition. Most important, the set is in praise of mothers then and now. One of them was Mary, mother of Jesus called Savior. 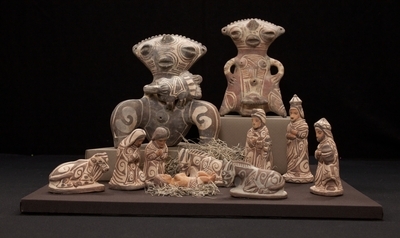 Terracotta figurines depicting the nativity of Jesus. The set was created in Venezuela by El Milagro. Date of creation is unknown. Exhibition label originally written by Fr. Johann G. Roten, S.M. for exhibit held at Roesch Library, University of Dayton.